TI-SmartView for TI-84 emulator software for Windows and Macintosh is an easy-to-use, effective demonstration tool for leading the classroom exploration of math and science concepts. 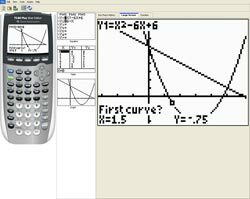 Based on the functionality of the popular TI-84 Plus family graphing calculators (and compatible with the TI-83 Plus family), the TI-SmartView compliments classroom calculator use by projecting an interactive representation of the calculator, plus offers many unique instructional capabilities. Highly interactive computer emulation of TI-84 Plus family graphing calculators (compatible with TI-83 Plus family). Helps increase student understanding of concepts by showing multiple, simultaneous representations of graph, table, and equation screens. (as recommended in the NCTM Standards). Provides a clear and easy way for students to follow along by graphically displaying key press sequences.